Posted by Heating And Cooling in Baby-proofing, Fireplace, Heating, HVAC, Toronto on Fireplace set up in your home. You know fire is dangerous, your 1-year-old does not. Since children like to explore new things and want to experience things on their own, a fireplace could be very fascinating for your child. While you cannot keep an eagle's eye on your crawling and walking child all the time, it is essential to take precautions so as to avoid any harm. All your baby would want it to touch the blazing flames. Although many gas fireplace setups have freestanding screens, they are not safe. Even a toddler's slight push is enough to pull the screen down. And then, the fire is all there. Danger! 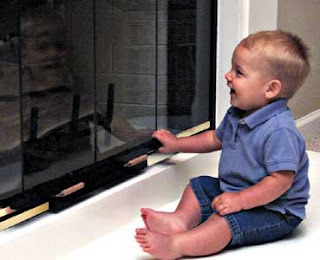 The right way to baby proof your fireplace is to install a barrier or moveable gate in front of the fireplace. You might be using an enclosed electric fireplace or woodburning stove. 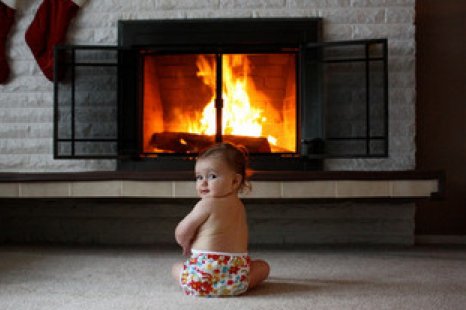 In this case, use child-proof locks to make sure your baby doesn't get to the inside of the fireplace to explore it. Keep the fireplace locked when not in use. If your baby's quest to explore is really serious, he'll find them anyway but for the good of him and yourself, keep the fireplace starters or remote controllers out of the sight of children. As they say, ''out of sight, out of mind'', let's hope your baby will forget to dig out the fireplace secrets by not seeing fireplace related things and activities around. If you've a fireplace with a hearth structure around, it could be really dangerous for your child. The tiles on the hearth are usually very hard. Also, the hearth edges are extremely sharp. As the little ones go up and down the hearth, there are chances of serious accidents particularly by coming in an improper contact with the hearth edges. In order to baby-proof it, install foam tiles in the area surrounding the fireplace. Your Gas Fireplace could be leaking carbon monoxide and your baby's life could come under serious risk with him breathing near the fireplace here gas is being leaked. Play safe and install a carbon monoxide detector near your gas fireplace. Also, don't forget to call a professional HVAC technician (of course certified) for a regular checkup of your home appliances and your Fireplace in particular. Maintenance of gas fireplace from professional drastically reduces the risks of accidents. We'd strongly endorse that with baby's presence at home, do not try to troubleshoot things on your own else you might end up worsening the problems. Ask professionals for assistance. In every Winter, hundreds of children are taken to the hospital emergency due to the accident caused by not baby-proofing the fireplace. The accidents may sometimes cause causalities. We've mentioned simple and practical steps to baby-proof the gas fireplace. Let's hope if you've babies, this article was of help for you and you'll follow the mentioned steps to baby-proof your fireplace. Happy Winters & be safe!